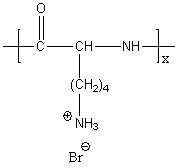 Poly-D-lysine hydrobromide is a positively charged synthetic polyamino acid having one HBr per lysine unit. It is a crystalline solid soluble in water. Poly-D-lysine hydrobromide is widely used as a coating to enhance cell attachment and adhesion to both plasticware and glass surfaces. This polycation is resistant to enzymatic degradation and has been used to culture a wide variety of cell types. Other applications for poly-D-lysine include the conjugation to active molecules for improved activities, the layer-by-layer deposition techniques, and the complexation with nucleic acids for gene expression. 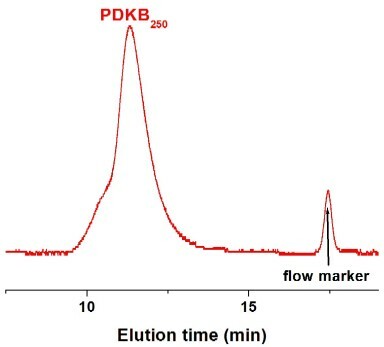 For cell culture applications, poly-D-lysine hydrobromide with a molecular weight greater than 30,000 Da is recommended. The poly-D-lysine hydrobromide (MW=52,000 Da) is easier to use because it is less viscous in solution, however the poly-D-lysine hydrobromide with an higher molecular weight (MW=84,000 Da) has more attachement sites per polymer chain available to the cells. Both poly-D-lysine hydrobromide and poly-L-lysine hydrobromide can be used as a coating substrate, however certain cells digest poly-L-lysine hydrobromide. In this case, poly-D-lysine, as the attachment factor, is necessary to prevent cell disruption by excessive uptake of L-lysine. Our poly-D-lysine hydrobromide has been purified by dialysis, sterile-filtered on 0.2um, lyophilized, and stored under Ar. Store poly-D-lysine hydrobromide under the condition of flushing with argon and protecting from light, and below -15°C.